In my lexicon, If one picture is worth a thousand words, pictures of children are worth tens of thousands of words. At a birthday party for my six-year-old great-grandson Alex this past weekend, we were able to record the faces of my three great-grandchildren and took endless shots of them, not just to commemorate the occasion but to make those little faces available to me when I return to Sewanee, Tennessee next month. 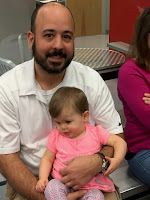 On days when fog hangs over the day and gray feelings reflect the weather, I bring up photographs of Alex, Kate, and Lillian (the twins) and am uplifted. 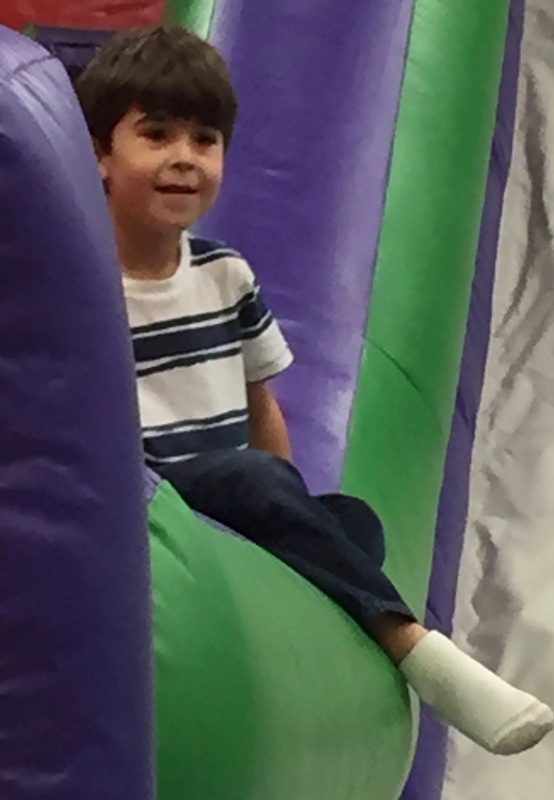 After making several road trips this past week, today I almost succumbed to gray, weary feelings, but I brought up the photos on my cell phone and was grateful that when I looked at those innocent faces I felt hopeful. I was also grateful for the devotion of the children's grandmothers because the Romero offspring are fortunate to have grandmothers who travel from southeastern and southwestern Louisiana to provide loving, extended family almost every other week, an experience my daughters hardly ever enjoyed. should evoke a smile or two from readers...or are they just products of inordinate great-grandmotherly pride? A footnote to the photos: The twins are on the cusp of becoming one-year-old. Lillian walks and Kate talks, and if you stand outside the door of their nursery, you can hear them talking to one another in twin language. Their favorite subject: When are we going to eat? I thought I interpreted a question Lillian asked Kate this weekend: Who's that old lady with white hair that keeps reciting nursery rhymes to us? It's that time of year again — Mardi Gras in French Louisiana. If readers want the full Monty about this celebration, a foray into Lyle Saxon's Old Louisiana provides an extensive account of this season preceding Lent. Saxon, one of the brightest raconteurs of his day, lived most of his life in New Orleans and devoted the first six chapters of Old Louisiana to Mardi Gras, explaining that the very name New Orleans "brings to mind a Mardi Gras pageant moving through the streets at night: crowds of masqueraders, rearing horses, great decorated floats glowing with color and glittering gold-leaf. Aboard the swaying cars are centaurs, mermaids, satyrs, gods and men, illuminated by flaring torches carried by strutting negroes robed in red..." Saxon sat on a balcony in front of the St. Charles Hotel during Mardi Gras, 1946, and described the first Mardi Gras to occur after WWII over a national radio broadcasting chain. Readers could say that he was talking about Mardi Gras while dying; a few days after his broadcast, he was hospitalized with cancer and died. For the tourist, New Orleans is the place to be during Mardi Gras activities, but, of course, Cajun Country has its own Carnival balls, parades, and private celebrations. At my age, I prefer the latter, especially when it takes place in the home of the Bourques in Church Point, Louisiana. 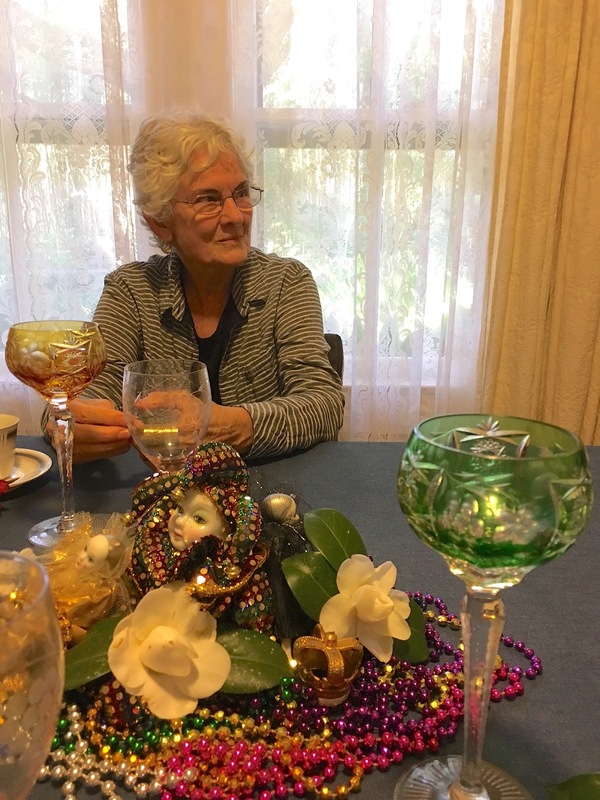 Like Saxon, Darrell Bourque, the former poet laureate of Louisiana and his wife Karen, a glass artist, have an abiding interest in "living well." When we get together with them, the atmosphere is charged with the energy of two accomplished artists — books are stacked on desks, in bookcases everywhere; regional art fills every room in their home and studio. 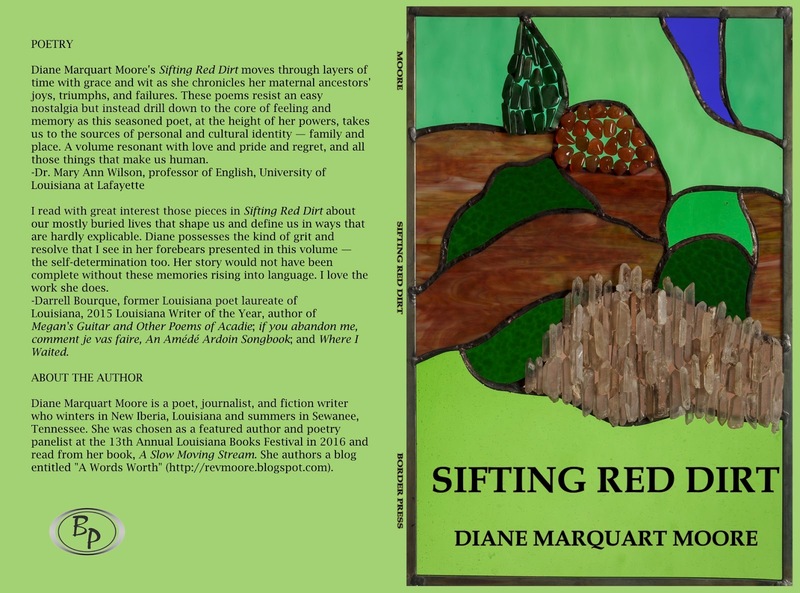 The studio is an old shotgun style house the Bourques renovated to resemble a Creole cottage, complete with heavily-battened blue shutters, facing the cobbled New Orleans style courtyard. A new addition is a wrought iron fence enclosing the cottage that adds to the Creole ambience. Each time we visit the studio, I discover glass pieces I've viewed before, but see them as new, in every corner. I find different displays of their grandson William's paintings, perhaps a new poem lying on the tall table where the two artists create both glass work and poems — everything is viewed as new. I tease my friends about my becoming a permanent guest holed up in their studio to write. Thursday, a Mardi Gras centerpiece decorated the dining table where we dined and talked for two hours. The food! Darrell cooks a magnifique pork roast with homemade sauce of roasted peppers and onions; Karen, a sweet potato casserole, fresh asparagus salad with homemade dressing, and Darrell always insists that we have nahn, which he knows I learned to love while living in Iran. "This is our Mardi Gras," Darrell said, and we toasted our long friendship as a way to celebrate that which is fun-filled and gracious in our lives. No loud fanfare, parades, costumed folks, no dancing in the hall — just lots of talk and doubling-over laughter. We got up from the festive table and went outdoors, where I usually insist on taking photographs so we can reminisce when we return to Sewanee for the spring/summer season. Four or five shots of us are required for me to look decent, linked with these two handsome artists, and Thursday we posed in front of one of Darrell's prize camellia bushes. Darrell, a consummate gardener, also raises grapefruit, lemons, and oranges and usually has a bumper crop of ginger but the last freeze destroyed these beautiful plants. His white camellias would rival the prize camellias in the gardens of Jefferson and Avery Islands, Louisiana. No Hail Rex and his royal court, no bursts of music, little parades of glittering floats, or the unrealness of a Mardi Gras scene... but the realness of a good time enjoyed by all. 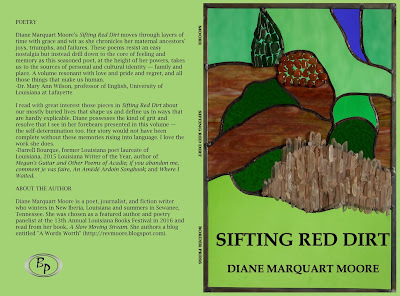 We came away feeling well-cared for following our celebration in the prairie country of St. Landry parish, a region of Louisiana I've learned to love after viewing it through the eyes of these elegant south Louisiana artists. While visiting in the home of Vickie Sullivan's 97-year old mother in central Florida recently, Vickie's sister came over with two old photographs of me and my grandson Martin in hand. 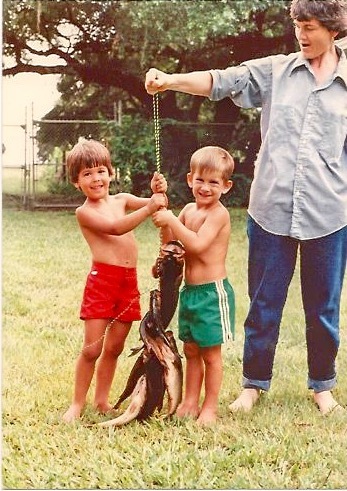 The photos probably dated back to 33 years ago, and one photo showed me holding a large bass I had caught; the other photograph showed my grandson Martin, Mary Ruth's oldest son Jacob, and Vickie holding a nice string of fish they had caught in canals on the Latt Maxcy Corporation Ranch. 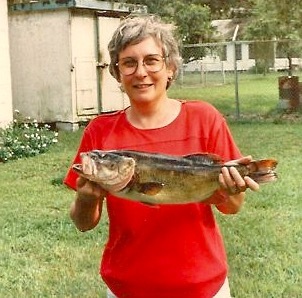 I couldn't believe that the large bass I held was my catch of the day, but there I was, wearing large-frame glasses popular back in the day, smiling over the fish that was stretched to full length in a snapshot that Mary Ruth had discovered among her memorabilia. Fishing was once among my favorite recreations, and I felt a jolt about my aging process when I looked at the photo. 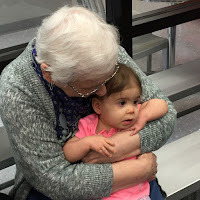 My blissful expression and that of my grandson in the photographs also jolted me into a consciousness of how recent photos of me show a lot of white hair and a certain worried look on my face. I was in my forties when we made this fishing jaunt, and I was enchanted with the landscape of central Florida — the grassy pastureland savannas with scattered clumps of saw palmetto, hammocks of live oaks trailing moss, and orange groves scattered among many glistening lakes. My nostalgia and memories of the past make it a happy time among hospitable people. At the time of the photo-taking, an abundance of bass, bream, and catfish filled the canals on the ranch with overflowing high water from the nearby Kissimmee River. Every cast that day had brought in a fish; however, I never returned to this bountiful fishing spot and later confined my fishing to casts from a pier that Vickie's mother built on the beach of her lakefront home. For a long spell, she fed the fish in Silver Lake daily, and on one occasion, I caught 23 bream, ceasing my fishing only when dusk came... and I began to think about having to clean the catch! They called it “floating the river,” one paddling, the other casting his way into eddies all day, pulling close to shadowy pools, perch beds where blue gills and sun perch darted for multi-colored flies thrown into their hunger. One summer, they allowed me along, and I was given a fly rod and shown how to crack the whip, two flies attached. When I felt the hard pull of two blue gills, plump, dark blue bodies tugging at the lures and breaking the surface of the water I knew why they went out on the river. Most days the sun was so hot they had to come to a hiatus under overhanging oaks every few hours to open a can of beer and say a few words to each other, but the less words, the better, the overwhelming silence a relief from talk required for the unending necessity of hands at work, making a living. The Bogue Chitto, Choctaw for “Big Creek,” was then clear water, and when we stopped under the bridge by The Tavern to replenish the beer, I could see the gravel bottom of the river, breathe in the desultory air, feel a part of that silence that had been broken only by the whiz of the line and a small snap as the line hit the water. They were both on their way to becoming alcoholics, and floating the river soon became something less spiritual, less recreation, and more drinking in the shade of the watchful oaks. I knew the only peace either of them felt was on that river, and I did not go with them often but when I did, I wasn’t afraid, even in sudden summer thunderstorms when we had to pull up on the banks and sit until the white flashes and rumbling stopped. I was only afraid of water moccasins dropping into the boat, preferring to be at the outer edges of the perch pools. Sometimes when the sun became unbearable, the paddler would start the motor of an old outboard and stir the heavy air, riding the current for a few minutes, the breeze pushing us on to another pool. 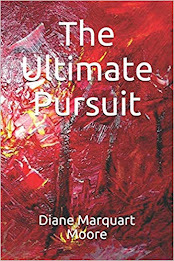 Years later, I would understand the meditative quality of those trips, no thoughts persisting, just concentration on the line flying into the dark pools searching for hungry perch, a hypnotic gesture, not caring what anyone thought, not wanting to hear anyone else’s problems, not moaning about life not being intact, but feeling the soul’s bliss, heart contracting with joy in the simple goodness of floating the river. Most of the time, serendipity comes to us when we veer off course and explore unfamiliar territory. While driving to central Florida recently, we left I-75 and followed US 27 to High Springs, Florida, a town of approximately 5500 people that is a destination for nature enthusiasts, which proved to be the site of serendipity. Once an important railroad center, the town now attracts sports people who enjoy fishing, scuba diving, swimming, canoeing, and tubing. Ichetucknee Springs State Park, fifteen miles north of High Springs, is a site of natural wilderness along the spring-fed Ichetucknee River; Blue Springs runs into the Santa Fe River; Ginnie Springs includes nine springs; Poe Springs Park, located five miles west of High Springs, is also on the Santa Fe River. Six miles north of High Springs, one of Florida's first state parks, O'Leno State Park, still maintains the old buildings and a suspension bridge the CCC built over the Santa Fe River back in the 1930's. We had been to the town several times for lunch at the Great Outdoors Restaurant, but on this jaunt, we decided to walk the main streets of High Springs to shop for a gift. 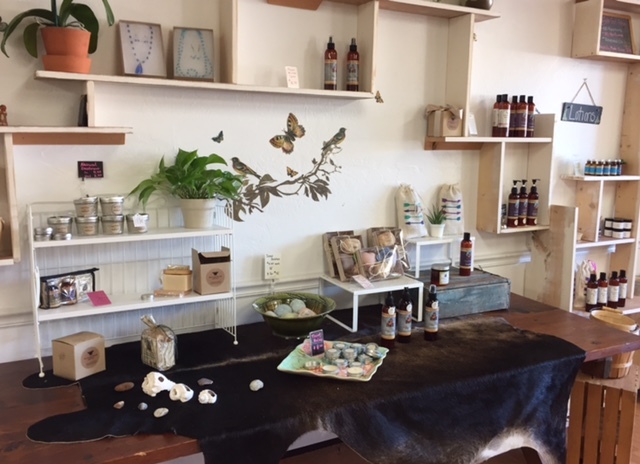 We wandered into a place called "Buffalo Girl Soaps" that offered all natural bath and body products, aromatherapy, and organic skin care and knew immediately that we had found more serendipity. 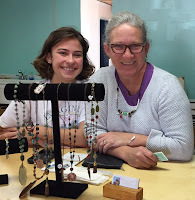 Megan, the young woman who welcomed us, is the daughter of shop owner, Luzette Kincaid Musen, who had been in business seventeen years. Her products include handmade batches of soap of 100 percent goat's milk and quality essential oils, natural clays, minerals, and wildcrafted herbs. The scent in this small shop tucked away in High Springs conjured up visions of relaxing in warm waters scented with lavender, rose geranium, and "mint tingle" soaps. Luzette Musen writes a blog and in it, she mentions that she maintains the products in her shop because she likes "the smells from growing up in the South...mossy green of the creek; warm dirt in a fresh-tilled garden, the heavy sweetness of vanilla in her grandmother's custard pie... These smells are wild, sometimes untamed, and on the adventurous side," she says. Her leitmotif is: "Start with natural ingredients. Be wild, untamed, and always stay adventurous." While we chatted with Megan, Luzette arrived. As she is a former biology teacher, she and my companion Vickie Sullivan, who is a botanist, began a discussion about plant biology and discovered similar interests in the use of natural products for general health care. Minutes passed, and our arrival time in central Florida stretched further away. 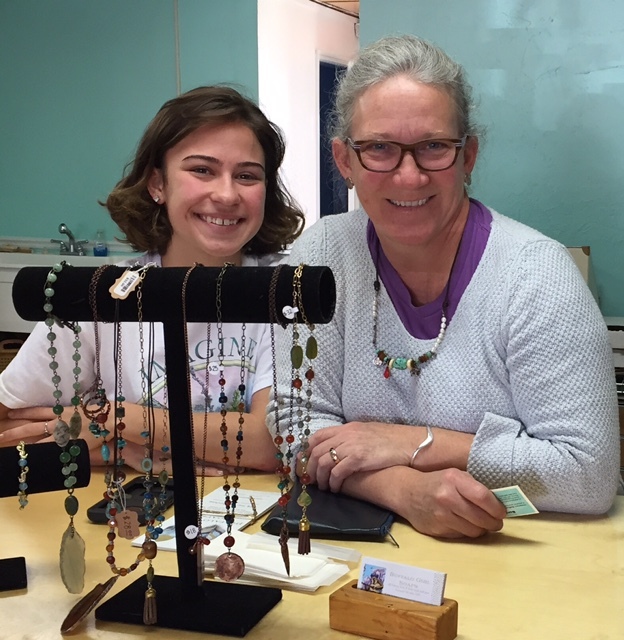 When we discovered that Luzette and her daughter had just returned from Washington, D.C. and had participated in the Women's March, moments became almost an hour before we left the shop. We learned that most participants in this event had chartered buses and the march was, as expected of women, beautifully organized. Although we didn't visit the historic Priest Theatre on First Street, built in 1910, we discovered that it had once been a place where vaudeville and traveling acts were performed. The theater had featured performers Smiley Burnett, who worked with Gene Autry; Roy Rogers and his horse Trigger; and Lash La Rue, a television star who performed with his whip. Today, the theater features three shows weekly. Performances are held on a raised stage with an arched opening and two columns on both sides and stairs on opposite sides of the stage that lead to the actors' dressing rooms. It will accommodate several hundred theatre-goers. Although High Springs offered more vistas to explore, we were two hours behind schedule and scurried away carrying the scent of serendipity with us and vowing to return to this small paradise off the beaten trail of the busy interstate.